How do you know that you have osteoarthritis of hip? The characteristic symptoms and diagnostic test helps in diagnosing the condition. 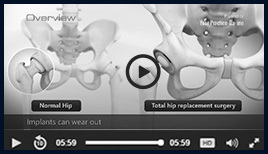 You will experience pain confined to hip and thigh, morning stiffness and limited range of motion. Medications: Pain-relieving medications such as NSAIDs may be prescribed. Topical medications such as ointments can be applied over the skin where there is pain. Surgery: Hip joint replacement surgery is considered as an option when the pain affects your ability to carry out normal activities.